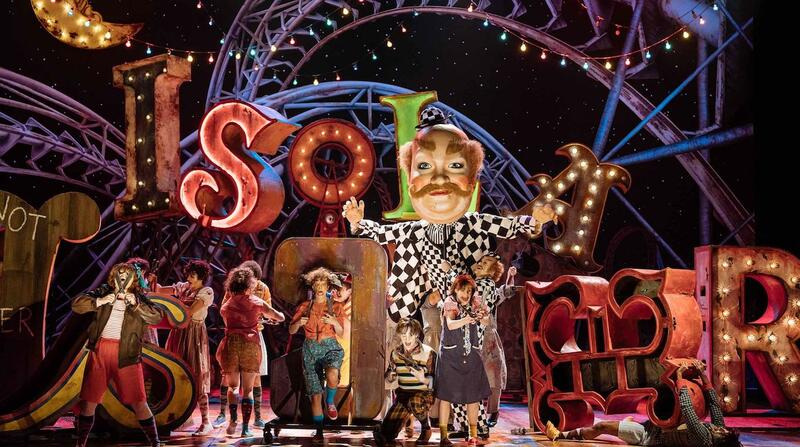 A stage musical of Pinocchio sounds like a brilliant idea, but all the magical stagecraft in the world cannot save a show if the book is weak. The National Theatre gathered a blue chip creative team to bring this treasured title to the stage. 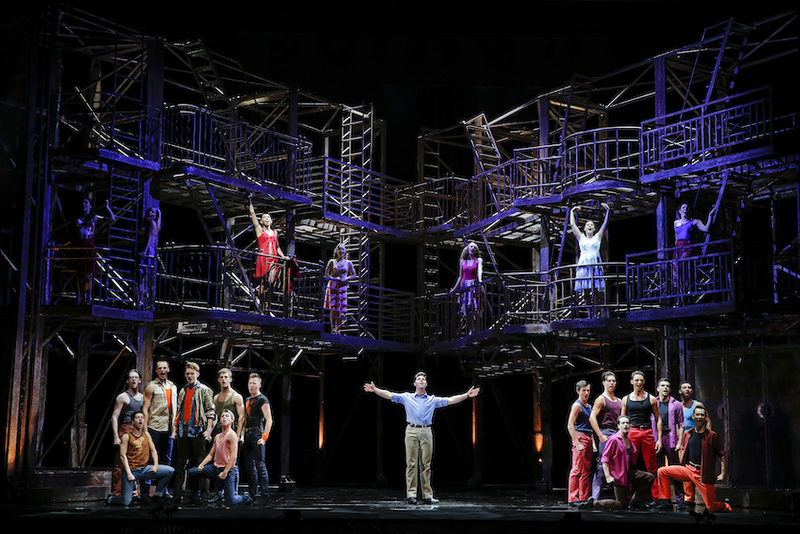 As seen in these production images, the design is stunning. Bob Crowley (Mary Poppins) designed both costumes and scenery, as well as co-designing the puppets. 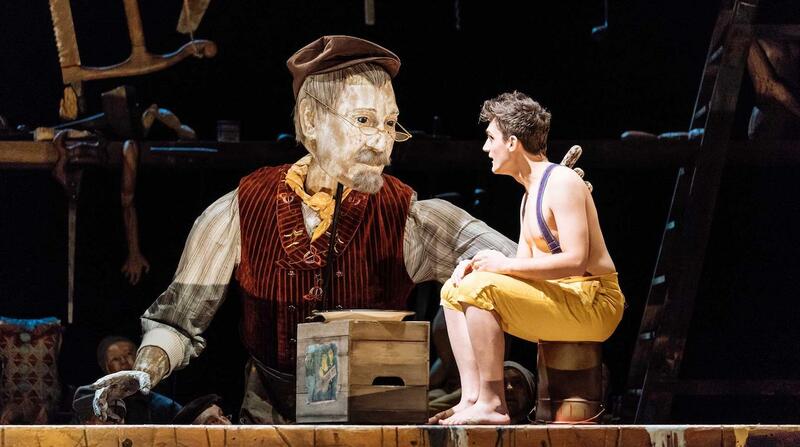 In a clever touch, humans are played by puppets, while an actor plays Pinocchio, the vivacious wooden boy. 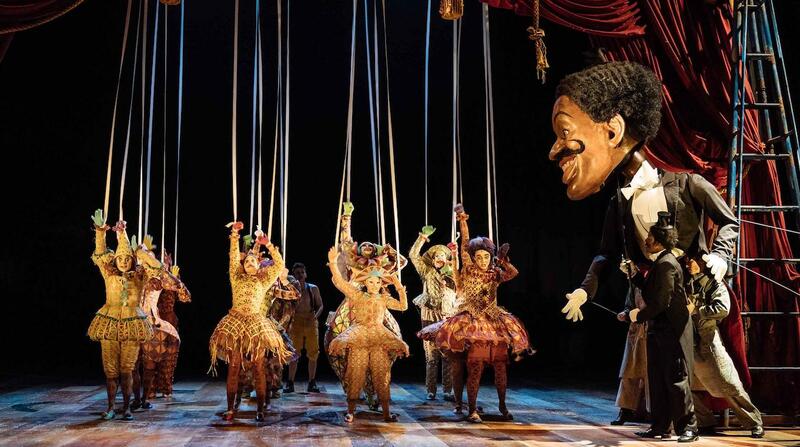 Directed and co-designed by Toby Olié, the puppets could have used moving mouths, but their scale and expression are very impressive. One of the best special effects is the magical flying flame that represents the Blue Fairy. To cover the magic of this effect, a good part of the show is performed in front of inky blackness. The stage is filled with colour, however, in certain scenes, when Crowley provides grand set pieces and vivid costumes. Director John Tiffany (Harry Potter and the Cursed Child) keeps energy high, striking an even balance between pitching the show at children an adults. The audience can readily suspend disbelief in regard to all the fantastical elements due to the level of commitment of the cast in selling the scenario with absolute conviction. Movement director Steven Hoggett has worked closely with Tiffany to integrate ongoing movement and to bring a sense of believable physicality to actors playing marionettes. All of this great work cannot overcome the flaccid book. Having the librettist of Matilda pen another dark children’s show should have been a perfect fit. Kelly’s episodic structure limps from scene with no tension, no humour and little or no character development. The plot basically follows the classic 1940 Disney animated movie, but there is no drive to the overall flow. Another mistake is changing Jiminy Cricket to a whining, nagging female character. Ever since Beauty and the Beast took the world stages by storm, musicals based on Disney movies have added extra songs for the stage. Curiously, there are no added songs here, just the same handful from the movie sung over and over and padded with additional orchestrations. 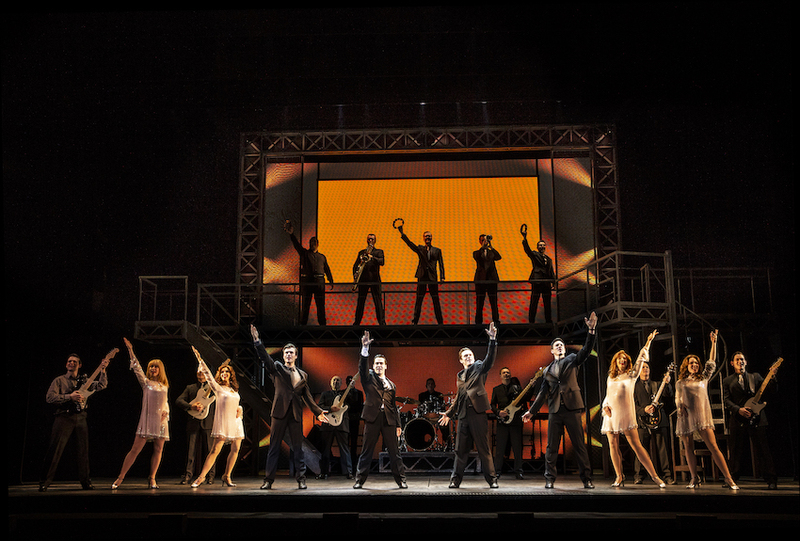 They are great songs, but not enough to sustain a musical of 150 minutes (including interval). Why bother paying a 15-piece orchestra and then not giving them sufficient music to play? 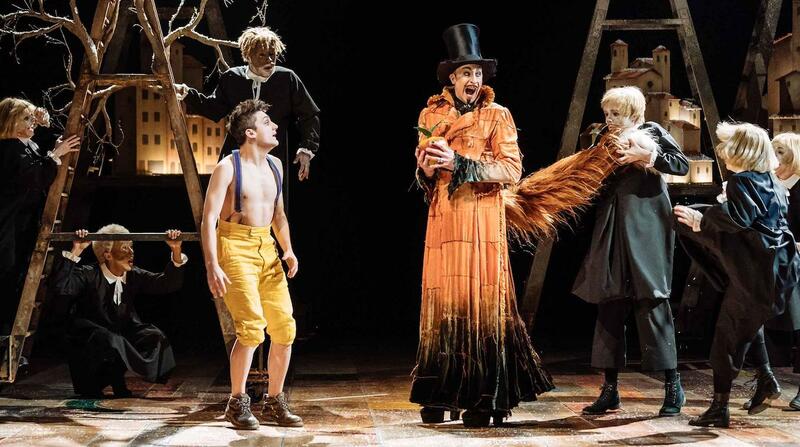 The cast of Pinocchio do their very best with the material on offer. Joe Idris-Roberts is plucky and likeable as Pinocchio, carrying the show with the flair and confidence of an actor beyond his years. 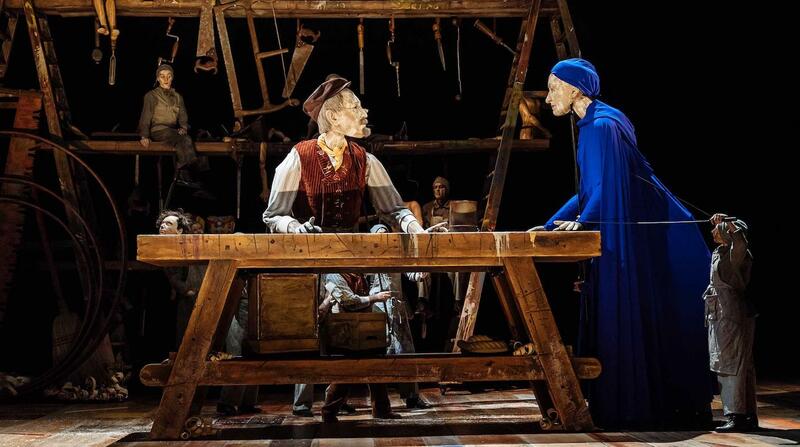 Mark Hadfield captures the kindly, sympathetic nature of Geppetto. Annette McLaughlin brings class to the Blue Fairy, whose mysterious presence and motivation is never really resolved. David Langham brings a sense of enjoyment to the wily fox, a role expanded here to drive all of Pinocchio’s bad decisions (because, apparently, the Fox wanted the piece of wood that Pinocchio was made from). Audrey Brisson successfully keeps our eyes on Jiminy while she provides the sweet voice. 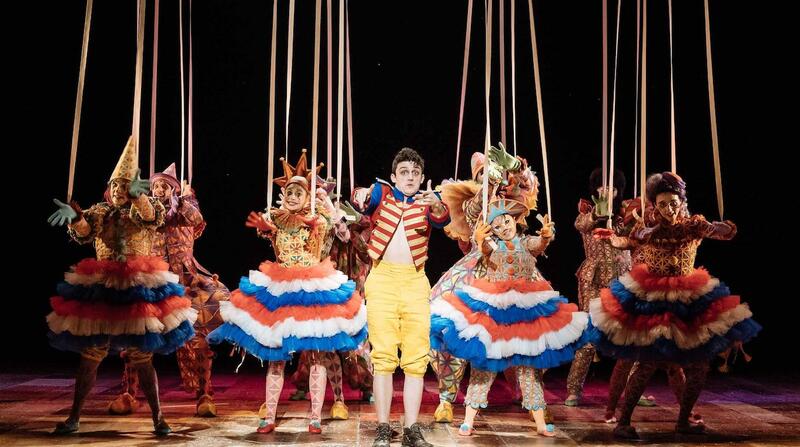 It is unclear whether children would be particularly taken by this production of Pinocchio. The show would certainly need more work before transferring elsewhere, particularly Broadway. 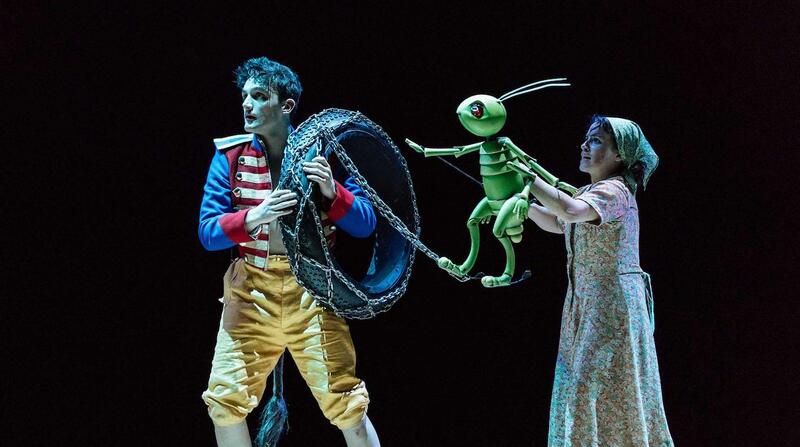 Pinocchio was reviewed 7pm 11 January 2018 at Lyttelton Theatre, National Theatre, London where it plays selected dates until 10 April 2018.